To get your breath going and your blood moving, there’s nothing more fun and effective than a rebounder. 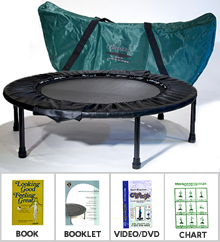 The rebounder I use is the “Cellerciser”. It features a wonderful buoyant bounce that is gentle on the knees and a very sturdy, durable build; it also folds in half for storage and portability. Bouncing is a wonderful way to begin warming up for singing and is also great for general exercise and for supporting the lymphatic system. And of course, kids of all ages love to bounce. It’s tremendously important for singing–and for overall health–to be sufficiently hydrated. 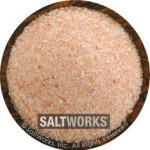 Pure, unrefined salt (with trace minerals) and pure water are the keys to hydration. Without good salt in our system, our tissues are not able to take in the water they need, even if we drink enough. And without sufficient hydration, the mucosal coating of the vocal folds will not have the thin consistency needed to vibrate freely and to create a beautiful sound.